On October 21st I attended the Fall Housing Trends Workshop presented by Jeffrey Otteau, president of the Otteau Valuation Group, Inc. I enjoy attending Mr. Otteau’s workshops because his evaluations and predictions related to the northern New Jersey housing market are well thought out, well presented and always backed up by impressive research. This current workshop was no exception. I was keen to hear Mr. Otteau’s thoughts on our current New Jersey housing market since my perception was that our post-recession housing recovery had stalled, based on the monthly numbers I have been seeing. Turns out I was right. I am using a few of the graphics Mr. Otteau used in his presentation with his company’s permission. All materials are copyrighted by The Otteau Valuation Group, Inc. Click on the graphics to obtain a larger image. Copyright 2014 The Otteau Valuation Group, Inc. 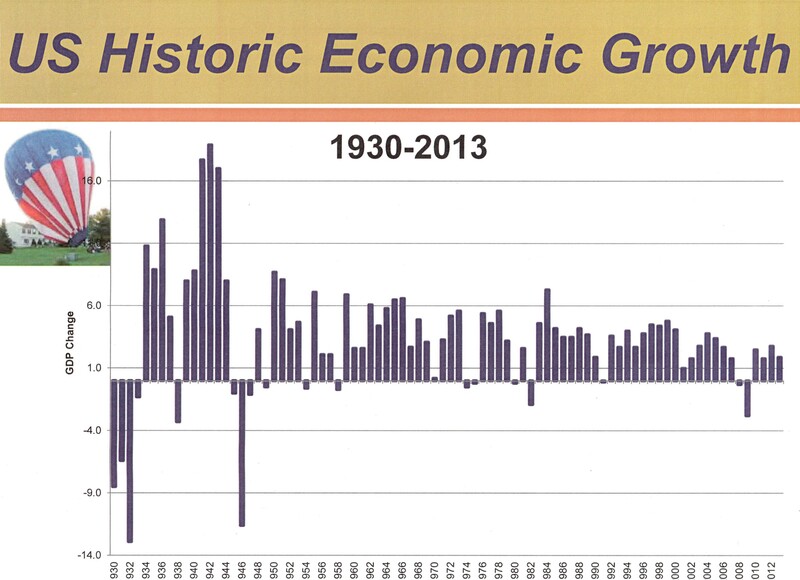 The workshop started with a long view of US economic growth since 1930. The startling fact is that, overall, US growth has steadily declined since the 30’s. The mightiest blows to traditional growth have been the rise of globalization and technology. Over time, emerging counties have provided heightened competition to economic production in the United States. Also, since the collapse of Communism there has been a rise in capitalist systems around the world as newly free societies adopted another economic model. Jobs have migrated away from our shores as a result. The second factor is technology, whose fundamental purpose is to replace people. It’s no secret that some work that was done by 10 workers in the past can now be accomplished by 1 worker and a machine or computer or, even, no humans at all. This was the general state of things regardless of the The Great Recession we’re recovering from in 2014. Our current housing market in New Jersey is a result of a number of factors related to that recovery, not the least of which is that New Jersey’s post recession job recovery has lagged behind the overall US number. New Jersey has, as of today, recovered 39% of the jobs lost in the recession, whereas the US, overall, has replaced 113% in the same time period. Housing strength is always, and obviously, in proportion to employment. This graph shows the rate of increase in New Jersey residents income (the consistently rising brown line) as compared to the rise in housing prices (the meandering blue line). You will notice that whenever the increase in housing prices outstrips the rise in income figures there is a correction to follow where housing prices collapse, most notably the decline which started in 2006 and continued into the Great Recession. Add to this, New Jersey’s residents’ average income has declined by 7.4% in the last 12 months as opposed to the overall US income growth of 1.8% and you have an emerging picture of where housing is at the end of 2014. New Jersey is a very expensive state from a consumer goods, taxes and regulation standpoint and housing prices have also risen, predictably, post recession. Mortgage rates, while still at historic lows have ticked up ever so slightly over the last year which knocked some people out the housing market since even an 1/8th or 1/4 point increase in rates will decrease the price of a home someone can hope to afford. Mortgage lenders are still over-compensating from the madness of the early 2000’s and this is also decreasing the amount of first time buyers in the market along with the absence of investors in income producing housing. Mr. Otteau also points out that New Jersey has some work to do with regard to its overall attractiveness as a destination. It’s ranked worst state for retirement, has the highest property taxes, the most restrictive land controls, and the highest domestic out-migration and share of young people living with their parents. There were a few more negatives mentioned but, enough already. You get the idea. 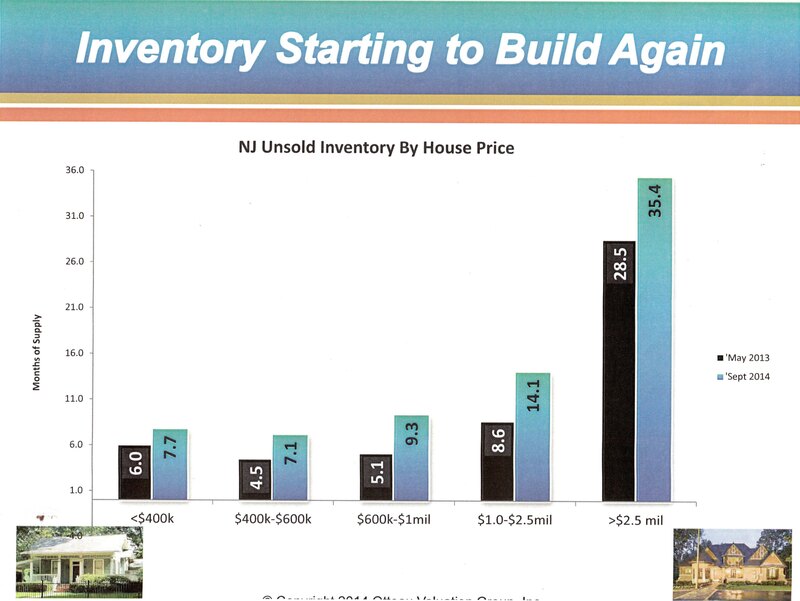 This all leads to a decrease in sales and an increase in inventories as New Jersey’s housing prices have stopped accelerating. The next few graphics illustrate this trend. Here we see that New Jersey’s housing inventory is rising again, expressed in months of supply, broken down by housing price. Please note that these are averages. There are 565 municipalities in the state and many of these markets differ. Glen Ridge, for example only has 2 months worth of inventory overall as opposed to New Jersey’s statewide 7.8% and Essex County’s 6%. Months of supply is also known as the absorption rate – the amount of time it will take for a market to absorb (sell) the inventory available. 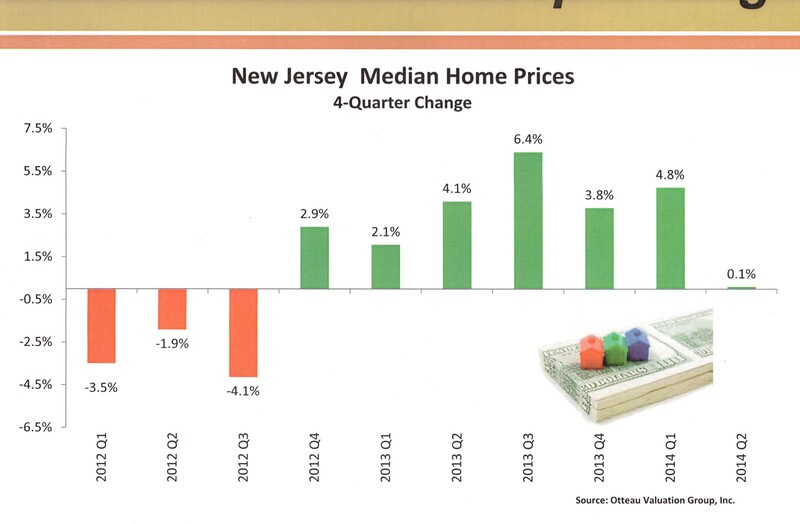 Next we see that the median home price in New Jersey has stopped rising in the second quarter of 2014. Again, some towns may be performing better than this. I monitor the numbers in my local area and, even though some are stronger than the statewide averages, I have seen recent slippage in numbers of sales, pending contracts and a slow down in the rise of local prices. 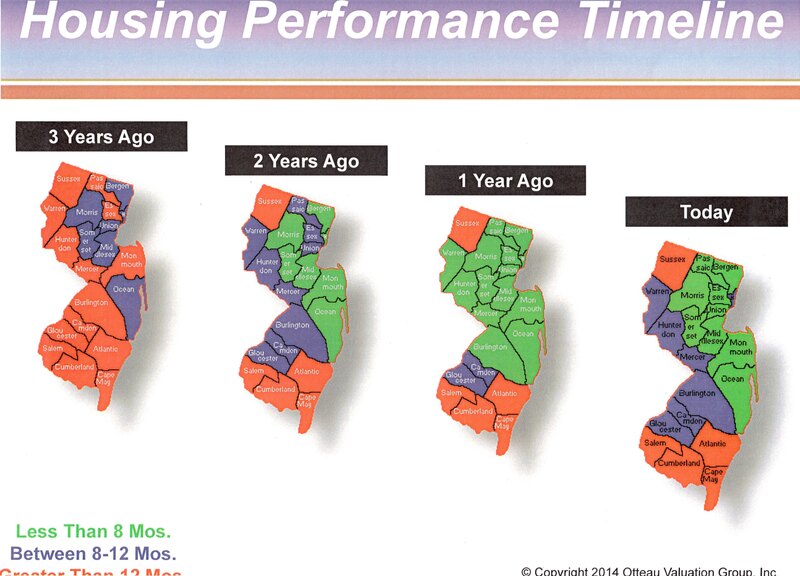 Sticking with the absorption rate model, this graphic shows the state’s months of housing supply, by region, over time since the recession. Red areas have more than 12 months supply, blue areas have 8-12 months supply and green areas have less than 8 months supply. The obvious improvement is shown since the period immediately following the crunch but the most interesting thing is the difference from 1 year ago. In 2013 the absorption rate was, in most of the state, less than 8 months of supply. In 2014 more of the state has fallen to between 8-12 months of supply. This is the bedrock conclusion of Mr. Otteau’s research and my on-the-street perception. Demand is cooling and we are not doing as well today as a year ago. One indicator is that 2014’s year-to-date number of purchase contracts in New Jersey is down 6% from 2013. The housing recovery will continue, according to the workshop’s conclusions, but slowly with slower increases in price, even with mortgage rates expected to remain low until the spring of 2015. 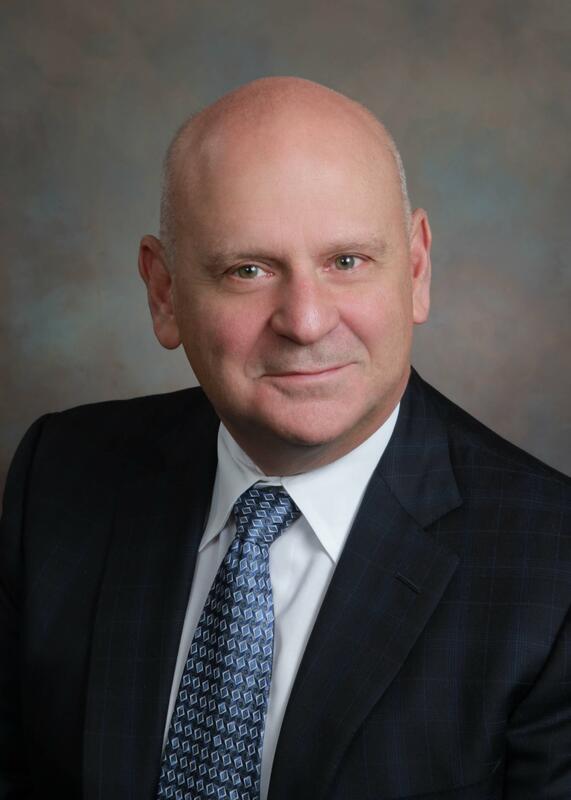 Next year Mr. Otteau predicts continued economic growth, continued, slow, housing price increases and mortgage rates approaching 5% by the end of 2015. In 2016, a presidential election year, Otteau predicts mortgage financing will begin to loosen with prices and interest rates still on the rise. Here’s my favorite graphic which Mr. Otteau provides in most of his workshops. 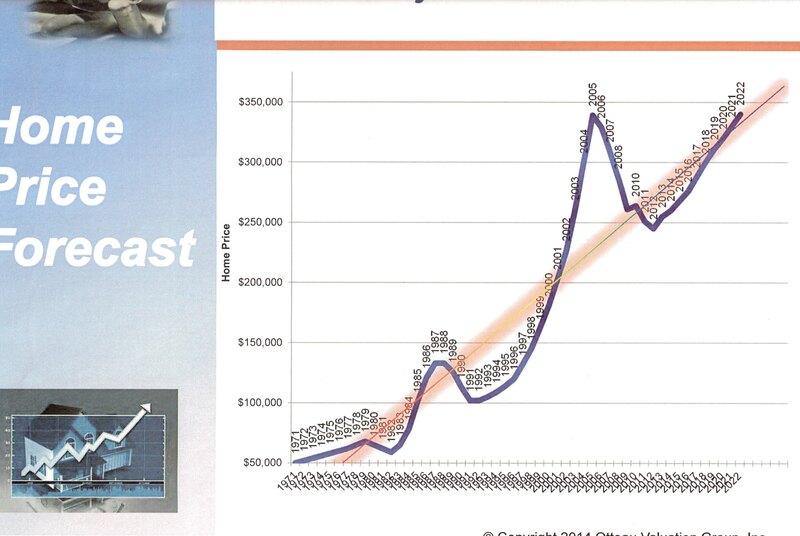 It shows the rise and fall and rise again of home prices in New Jersey for the period 2000 to 2022. 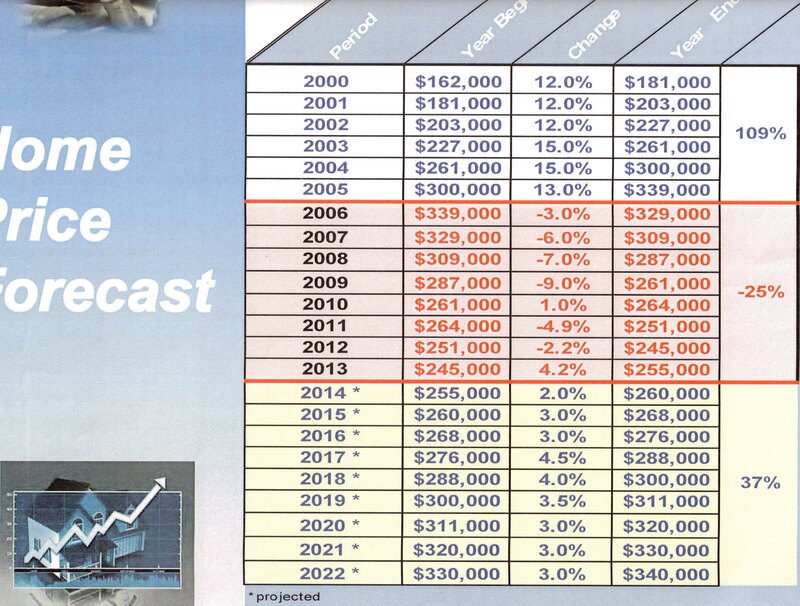 If a home was worth $339,000 at the brink of the housing crunch in 2005 it will be worth that same price again in 2022. When I attended the fall seminar 1 year ago it was 2019 so, once again, we are backtracking. So, what conclusions should a consumer take from all this? Buyers should not wait. Rates and prices will increase, supply will probably decrease and the sellers’ advantage will be stronger as a result. Sellers should be practical and realistic in offering prices and acknowledge that buyers have some emerging advantage. I won’t counsel sellers to wait until their advantage strengthens. As the last graph illustrates it will be a long wait. In the meantime we are experiencing a more normal market which is equally advantageous to both buyer and seller.